Written by Tropicasa Realty on January 29th, 2019 January 31st, 2019 . 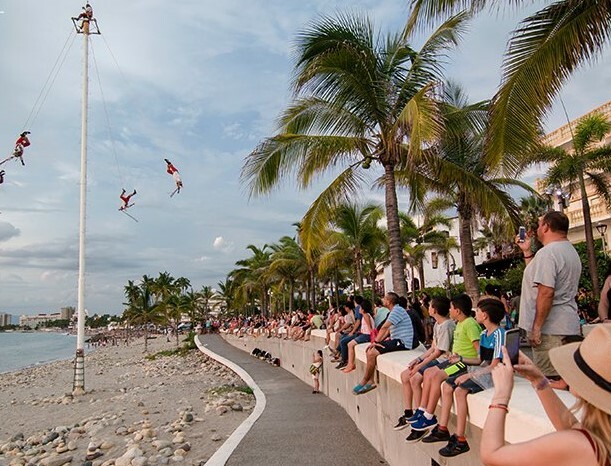 Located on the famous Malecon, one of the local attractions that never fails to delight Puerto Vallarta property owners and visitors alike, is the Danza de los Voladores, flying through the air with a burst of color high over the beach below. Meaning “Flying Dancers” in English, the Danza de los Voladores is an ancient ceremony of the Otomi, Huastec and Nahua indigenous tribes of Mexico, which became practiced throughout Mesoamerica. In beautiful handcrafted, colorful costumes, the dancers scale a 30 meter/ 98 foot pole, high about the gathered crowd of spectators below. Then four dancers, each tied to a rope, launch themselves from the top, spinning their way down to the ground in a slow descent, dancing to the sounds of the fifth dancer who provides musical flute and drum accompaniment from the top of the pole. Named as an Intangible Cultural Heritage by UNESCO to protect this ancient ritual, said to have been created to please the Gods and help spare indigenous tribes from drought, you can watch this amazing performance several times a day from the Malecon, or maybe even be lucky to be able to witness it from the terrace of your own Puerto Vallarta condo. I love my studio condo that I bought looking out over the river.